Friday June 8th 1883 Mother and I went to town the first thing this morning and got a new carpet for the dining room. I brought home some sewing for Hatt that I did right away after dinner and then cut out Mays dress and worked on that till bed time. 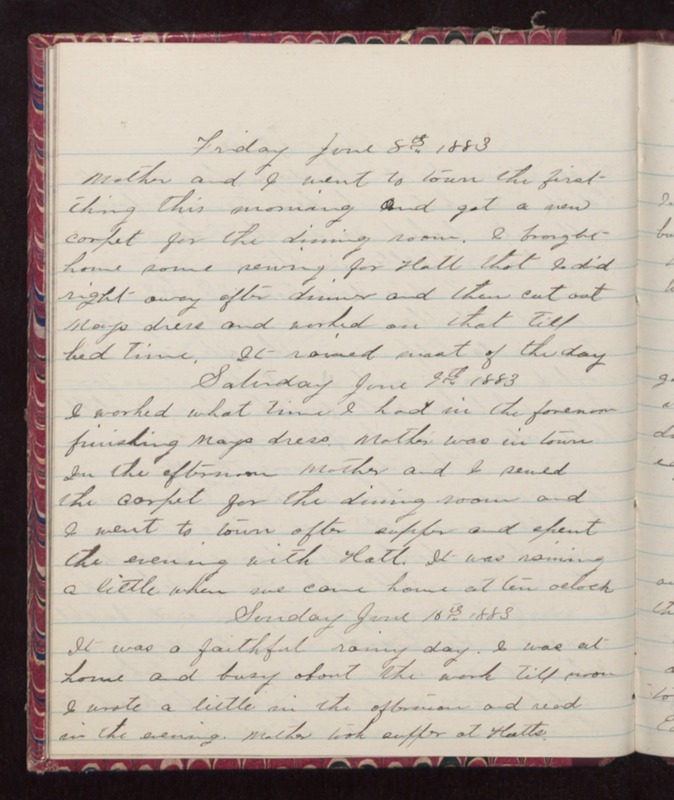 It rained most of the day Saturday June 9th 1883 I worked what time I had in the forenoon finishing Mays dress. Mother was in town in the afternoon. Mother and I sewed the carpet for the dining room and I went to town after supper and spent the evening with Hatt. It was raining a little when we came home at ten oclock Sunday June 10th 1883 It was a faithful rainy day. I was at home and busy about the work till noon I wrote a little in the afternoon and read in the evening. Mother took supper at Hatts.